Perennial All-Stars Sidney Crosby and Evgeni Malkin lead the high-scoring Penguins against Anders Lee, Mathew Barzal and the defensive-minded Islanders in the first round of the playoffs in the teams’ first postseason meeting since 2013. Pittsburgh won back-to-back Stanley Cups in 2016 and ’17, before Trotz led Washington past the Penguins en route to the franchise’s first championship last year. He then left the Capitals and joined the Islanders, leading New York back to the playoffs after a two-year absence and following the departure of former captain John Tavares in free agency last summer. Under Trotz, the Islanders went from giving up the most goals in the league a year ago to allowing the fewest this season. Picked by many experts to miss the playoffs again, the Islanders thrived under their Stanley Cup-winning coach. They led the Metropolitan Division for a large stretch of the season, before holding off the Penguins for second place and home-ice advantage in this series. Lee was New York’s top scorer 28 goals, and Brock Nelson had 25. Barzal (18 goals, 44 assists) led the way in points for the second straight year. Josh Bailey (16 goals, 40 assists), Nelson (28 assists) and Lee (23 assists) also had 50-point seasons. The Penguins overcame a rough start that saw them tied for last in the Eastern Conference in November to return to the playoffs for a 13th straight season, the longest active streak in the NHL. They did it while enduring injuries to several players, including Malkin, defensemen Kris Letang and goalie Matt Murray. Led by Jake Guentzel (40 goals, 36 assists) and Crosby (35 goals, 65 assists), the Penguins were sixth in the league in scoring. Crosby had his first 100-point season in five years, and Phil Kessel (27 goals, 55 assists), Malkin (21 goals, 51 assists) and Letang (16 goals, 40 assists) also topped 50 points. SULLIVAN VS. TROTZ, ROUND 4: Trotz and Penguins coach Mike Sullivan are facing off in the playoffs for the fourth straight year. The previous three were all in the second round, and the winner of Penguins-Capitals series went on to win the Stanley Cup each time. Now, Trotz is in New York and facing a familiar foe in April. “We’re probably in the same boat, we know a lot about each other,” Trotz said. PLAYOFF SUCCESS: Crosby and Malkin have led Pittsburgh to three championships (2009, ’16 and ’17) and two other deep playoff runs during its postseason streak. The Penguins return largely the same group that won their recent Cups, and won nine consecutive playoff series under Sullivan before the second-round loss a year ago. The Islanders still have only one postseason series win since 1993, when they got past Florida to reach the second round in 2016. Only about half the players from that team remain. They have been infused with a mix of young stars and veterans, including Valtteri Filppula and Leo Komarov. GOALIES: Murray was on the Penguins’ past two championship teams, and ended an uneven season on a serious upswing after dealing with a pair of injuries over the first half. Pittsburgh relied heavily on the 24-year-old down the stretch and he responded by going 10-4-4 with a 2.20 goals-against average and a .931 save percentage over his final 18 starts. The Islanders used the tandem of Thomas Greiss (23-14-2, 2.28 GAA, five shutouts) and Robin Lehner (25-13-5, 2.13 GAA, six shutouts) to win the William Jennings Trophy for allowing the fewest goals in the league — a testament to the defense-first mindset under Trotz. SPECIAL TEAMS: The Penguins were fifth in the NHL on the power play, converting 24.6 percent of their chances. The Islanders struggled, finishing at 14.5 percent — ahead of just Montreal and Nashville. Despite its success with the man advantage, Pittsburgh proved vulnerable to giving up chances at the other end, allowing 15 short-handed goals — tied with Boston for the most in the NHL. Both teams had a similar rate of success on the penalty kill at around 80 percent. The Penguins were also opportunistic, finishing third with 12 short-handed tallies, while the Islanders had six. SEASON SERIES: The teams split their four games, with each winning once on the opponent’s home ice and each getting a win in a shootout. 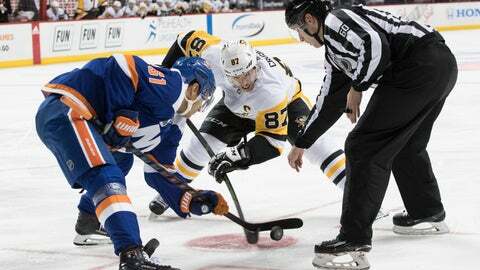 The Islanders won the first two, 6-3 at Pittsburgh on Oct. 30 and 3-2 at Brooklyn’s Barclays Center two nights later. The Penguins won 6-2 at home on Dec. 6 and 2-1 at the Coliseum on Dec. 10.